LOK - Family पेड़. Kya looks so pretty :). HD Wallpaper and background images in the अवतार द लास्ट ऐर्बेन्डर club tagged: avatar the last airbender aang katara toph kya tenzin bumi korra. Kya looks just like mum! And she's wearing Katara's necklace! Oh, I can't wait to see her in the series! But in the first LOK ep. Katara still wears her mother's necklace, 'cause it has the same design I guess. ummmm, what is Legend of Korra? He is. He's so funny too! 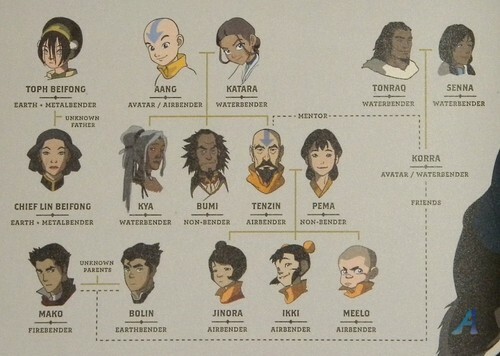 I just want to know who the heck are Bolin and Meko's parents! Bolin remind's me of Sacka and Meko reminds my of Sukkie, so my money is on them. Is that really what Kya and BumiG look like? Who was Lin Be Fongs dad? read atla comic book full free " अवतार प्यार potion #8 "